It is said, “Well begun is half done.” Well, we are certainly well begun. Please help us come and begin the rest. Two years ago, controls industry leaders came together at BuilConn to launch oBIX, an initiative to utilize IT standards for building management. This was intended to provide for more efficient, secure, standard and Enterprise friendly communications over internal networks and the Internet. Technically this is achieved with XML and SOAP, working together as Web Services. At BuilConn this year, we will see that first step is near fruition. 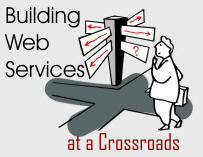 Just about any kind of control system can produce and interact with Web Services. oBIX will demonstrate interoperability and describe the path to the first release of its standard. However, even with all this progress in Web Services, Control Systems are still not truly ready for the enterprise. Great progress has been made, but not yet enough. Reference implementations of oBIX as a WS-DM Services and as a WS-Management service. The annual meeting of oBIX is in Dallas on Monday afternoon, March 21, before BuilConn. This is an open meeting, and I am inviting not only oBIX members, but also all parties to come and discuss the future of Web Services and the Enterprise. There are places at the table for BACNET and LON, for Web Services and IT, and for Owners and Operators. It is said, “Well begun is half done.” Well, we are certainly well begun. Please help us come and begin the rest. If you are interested in a fuller background of these issues, please read here.